MENG Xue, QI Xiaoyu, LIU Weixian, WANG Yao, WANG Qiuxu. Effect of HBXIP Expression on the Biological Behavior of the Adenoid Cystic Carcinoma Cell Line ACC-2[J]. Journal of China Medical University, 2017, 46(12): 1082-1086. Abstract: Objective To study the effect of hepatitis B virus X-interacting protein (HBXIP) on the proliferation, migration, and invasion of ACC-2 cells, and the possible mechanism of the PI3K/Akt signaling pathway involved.Methods The chemically synthesized HBXIP-siRNA plasmid was transfected into the ACC-2 cells. 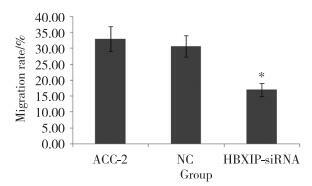 RT-PCR and Western blotting were performed to detect the expression of HBXIP in the ACC-2 cells. Cell proliferation was measured via MTT assay. The invasive and migratory abilities of the ACC-2 cells were evaluated via the transwell chamber assay and scratch test, respectively. 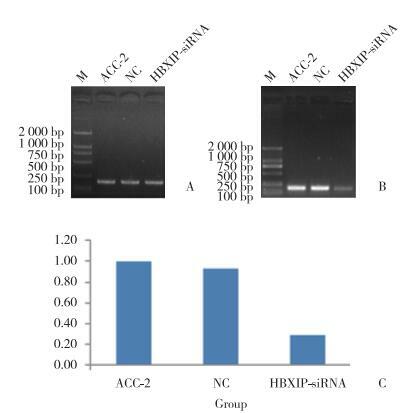 Western blotting also detected the impact of HBXIP-siRNA on Akt, p-Akt, PI3K, p-PI3K, and S100A4 protein expression.Results HBXIP was highly expressed and HBXIP-siRNA was successfully transfected in ACC-2 cells. MTT results showed that the number of surviving cells in the experimental group was significantly lower than that in the control group (P < 0.05). The scratch test results showed that the mobility of the experimental group was significantly lower than that of the control group (P < 0.01). 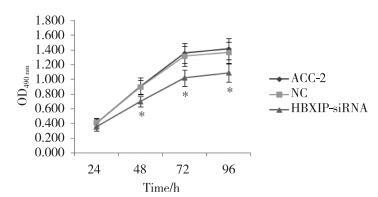 The transwell assay showed that the rate of cell invasion of the experimental group was significantly lower than that of the control group (P < 0.01). Finally, Western blotting results revealed that the expression of p-Akt, p-PI3K, and S100A4 was relatively decreased in the experimental group when compared to that in the control group.Conclusion Silencing the HBXIP gene inhibited ACC-2 proliferation, invasion, and migration. MELEGARI M, SCAGLIONI PP, WANDS JR. Cloning and characterization of a novel hepatitis B virus x binding protein that inhibits viral replication[J]. J Virol, 1998, 72(3): 1737-1743. 何荣根, 张晓珊, 周晓健, 等. 涎腺腺样囊性癌ACC-2和ACC-3细胞系的建立及其形态学观察[J]. 华西口腔医学杂志, 1988, 6(1): 1-3.